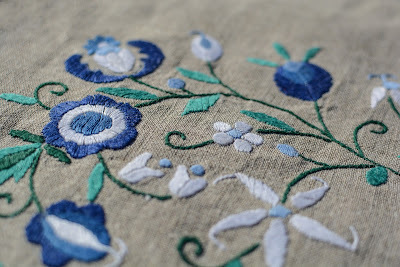 The stem stitch is a variation of the back stitch, and it's used a lot in flower embroidery as well as many other types of hand embroidery designs. The stem stitch is a fairly easy stitch to master, and it adds a beautiful effect to your embroidery designs. The stem stitch and back stitch are so similar they can almost (but not quite) be used interchangeably in some flower embroidery designs. While the back stitch forms a line of stitches that look like machine stitching on the surface, the stem stitch adds a touch of width and boldness to the effect. It's thicker lines enhance the appearance of stems and leaves on flowers, and you can also use it for things like lettering in monograms or borders any time you want to frame something so it really stands out. Bring the needle up through the fabric from the back at the desired starting point. Bring it about 1/8-inch forward then poke it back down through the fabric. In the center of the stitch, just to one side, bring the needle back up through the fabric. Move the needle 1/8-inch forward and poke it back through the fabric. Repeat this over and over until you reach the end of the line to make your desired shape. Anchor the stitches on the back side of the fabric by making two or three tiny stitches. 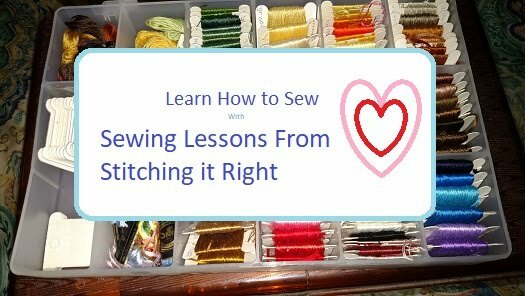 The video tutorial below shows how to do the stem stitch if you would like to also watch how to do it. Hand embroidery can be a really enjoyable way to pass the time and make some unique creations. It does take patience and practice, though, and sometimes it takes a while for designs to take shape - as you can see in the video, where the freehand flower embroidery design I'm creating in this quilt square is only just beginning to take shape after several episodes of Sewing Lessons from Stitching it Right. Questions and comments are always welcome here, in our new Facebook group or our long-time Facebook page, or on the Stitching it Right video channel.